Built from GRP and carbon fibre to RINA standards, the 29 metre superyacht was launched in January, marking the yard’s first launch of the year. Eurus follows the deliveries of the first three units, Zehra, Uriamir and Christella II. Speaking at the delivery ceremony, which took place on February 27 at the Viareggio-based yard, chief executive Franco Fusignani complimented the "passion and devotion" of the yard in finishing the build. He previously revealed that Benetti's Via Coppino facility will deliver another 13 boats in 2019, including four more Delfino 95 units. 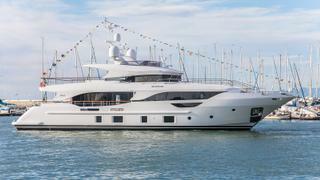 “This model has proved to be a successful one for Benetti, with six units already sold and four in production right here in Viareggio,” he said. 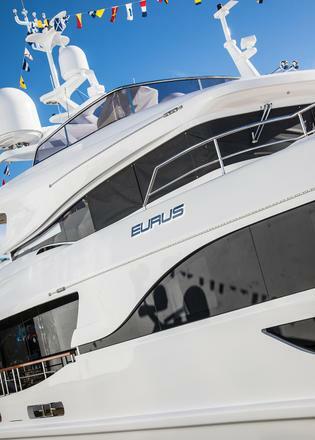 The four-decked Eurus features exterior design by Giorgio M Cassetta while interior design was handled by Benetti’s in-house design team. The interior style is “precious and refined”, according to the shipyard, with key materials including light and dark oak and Zebrino and limestone marble. Key interior colours include soft shades of pink, green and light blue. Accommodation is for a total of 10 guests in five cabins while the main deck stern based saloon features a dining area large enough to seat 10. The main deck galley is also located on the main deck and is fitted with a wine-cellar, ice machine, two washing machines and two dryers. The galley stairs lead down to the lower deck where three crew cabins accommodate a total staff of five. The owner's suite sits at the bow of the main deck and features a private bathroom. The remaining four guest cabins, including two VIPs, sit on the lower deck. All are equipped with private bathrooms. 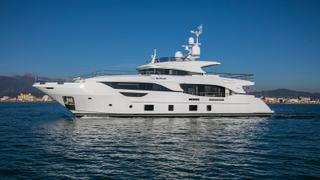 The upper deck is equipped with sofas and sunpads while a number of furnishings have been chosen by the owner. Power comes from a pair of MAN V8 1000hp engines for a top speed of 13.5 knots.